When you see an instrument like Chinese Spike Fiddle, you know you are in for something special. And Illumion's 'The Waves' is simply spectacular! 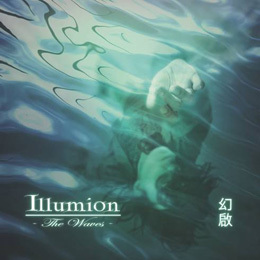 Illumion is a Dutch band with two full length and one demo album under their belts. The band is made up of Eveline Van Kampen, electric and acoustic guitars, Erhu, mandolin & backing vocals; Esther Ladiges, vocals and percussion; Peter H. Boer, 6-string fretted and fretless bass, Stick, double bass, Taurus 3 & backing vocals; Gerton Leijdekker, keyboards, acoustic & electric guitars, guitar-synth & backing vocals; and Tom Rutgers, drums & percussion. 'Ember' ignites the album with what sounds like a fuse being lit. The cool keys, bass, and drums that take off from here are so original sounding you know you are in for a treat with this album. Ladiges' vocals are mysterious and so different than anyone else you may have heard before. Lyrics are well written and delivered with authority. An epic, over nine minute opener guaranteed to lock on your attention for the rest of the album. The guitar work is solid, original and powerful. 'Adamantine' continues the elegant guitar work along with Ladiges' vocals drifting softly over the excellent keyboards. The power chords that develop are awesome. Powerful guitar patterns surround and grind as the keys fly through, excellent. The kind of instrumentals, near the track's end, that you could listen to all day. You never want them to end. 'The Craft of Memory' opens with cool bass like keys, exploding drums, and hammering bass mixed well with lunging guitar. The percussion keys in the background add to the mystery. Intricate piano follows along with excellent mandolin and acoustics. 'A Tale Of Kings' opens with some of the best keyboard effects on the album, before powerful lead and bass guitar, along with well – paced drums, drive forward like the 'Charge of the Light Brigade'. Excellent keyboard effects blend their way through the soundscape keeping the listener entertained at every bend in the river of rhythm and melody. 'Sorrows End' opens with strong, direct piano keys, before lead electric guitar falling like leaves. Then, Ladiges' voice, follows, full of poetic lyric. The excellent bass and keys that follow will take you off to dreamland. That trumpet adds to the immense soundscape unfolding before your ears. Ah…'Espirando'! The best opening on the album, by far. That Spanish guitar along with the drums and percussion. Oh…why couldn't it have gone on forever? Then the track slows down to elegant acoustic guitar and soft drums. The guitar solos are wonderful. But nothing matches that opening. Almost felt like as strong as Procol Harum's 'Conquistador', but then it drifts into a slow progressive rock dirge. Darn it. But no, don't lose hope, after all the song is named wishing. The acoustic rumble returns with excellent Spanish guitar and that wonderful rhythm and melody. 'Mystify' opens with brief poetic spoken word, from the world renowned Arjen A. Lucassen, (fancy finding him here…but after all it's a Dutch band), before Ladiges' vocals dreamily weave their way back into the mix. Ladiges' vocals have that elegance that you can easily associate with the likes of Kate Bush. Her voice is a great mix between say Kate Bush and some of my favorite singers from the Bond films of the '60s. She doesn't have the high pitched voice of many of the females in this genre, in fact, her voice is perfect. Soft and relaxing. The acoustic guitar soloing on this track is well worth the price of admission. Well done. The keys that follow only add to the magic. One of the best tracks on the album. More of that fantastic Spanish guitar follows. You know they must like it, but are afraid to overdo it. It's a shame. 'Canvas' opens with waves and bird sounds mixed well with chimes. Then some excellent soft bass and guitar. The bold keys build momentum and are interrupted by some of Ladiges' best vocals. Excellent bass work. 'The Waves' return to the shore to complete the epic finale. Scribbling on paper as haunting keys, then bold lead and bass guitar, blasting from the crashing waves launch outward. They end with the waves going out to sea. Every once in a while you get the pleasure of finding something extremely unique. This was one of those experiences. I am now working on gathering together their back catalog. A great mix of progressive rock filled with new elements and original sounds and rhythms. Just listening to Ladiges' vocals alone is worth the price of admission. Definitely a headphone album. The sound is so rich without any outside inference. You just have to experience this album to believe it.